There are two oneworld lounges in the Satellite Terminal of NRT: the JAL lounges and the Qantas lounge, which I’m reviewing here. (For oneworld lounges at NRT, there’s also the JAL lounges in the main terminal, the AA Admirals Club, and a Cathay Pacific lounge). The Qantas lounge at Narita is very spacious with tons of seating. When I visited, there weren’t any Qantas flights departing soon, so there were only two other passengers in the lounge. But that’s also perhaps because there’s very little reason to visit this lounge when the JAL lounge is just steps away. In addition, because there were no Qantas flights departing imminently, the food selection was very sparse. There were just a couple of snacks available. But later, as more people arrived in the lounge due to an upcoming Qantas flight departure, they added more food, so there was eventually a soup, sushi, and some other random foods on offer. There are four shower rooms in this lounge, although I didn’t use any of them. There was Australian beer on offer in the fridge, as well as some alcoholic drinks that I had never tried before. They also offer a variety of English-language newspapers, if you’re looking for those. I’m a big fan of the Qantas lounges at Hong Kong and at LAX, but this lounge is pretty generic and uninteresting by comparison. Not much reason to visit unless you only have a Qantas Club membership or something, given that the JAL lounge is superior in most ways and is nearby. This entry was posted in Lounge Reviews, Qantas, Travel, Trip Reports and tagged airport lounge, lounge review, nrt, qantas, travel, trip report on June 22, 2016 by Edward. I’ve reviewed the JAL First Class Lounge in the Main Terminal of Tokyo Narita (NRT) airport before, but this trip (in November 2014) was my first time in the First Class Lounge in the Satellite terminal. I love Japan Airlines much more than many travel bloggers, mostly because I think they have great food (except for their special meals), both in the air and on the ground. The lounge agents were super welcoming when I was checking in. JAL offers short massages to first class passengers, so you should see if they have open slots right when you enter the lounge because they can fill up quickly. The lounge was pretty empty when I was there, so I was able to arrange a massage during my layover. The lounge features lots of different seating options with varying degrees of privacy and ample power outlets. Since I had just gotten off a long-haul flight, I asked for a shower. The shower rooms are quite small and a bit too warm for my liking, but the room was clean and I enjoyed the shower amenities that they have. After my shower, I was able to get a 10-minute massage. It wasn’t anything special (the massages that I’ve gotten in Cathay Pacific’s the Pier lounge and the Thai Airways Spa have been better), but it was still nice and appreciated after a long flight. The lounge has drinks and snacks available, including Hokkaido milk, which is supposed to be some of the best milk anywhere, and the Sky Time drink that’s made specially for JAL. In this lounge, there’s a separate dining area where they serve food (and you’re expected to keep the food in the dining room). 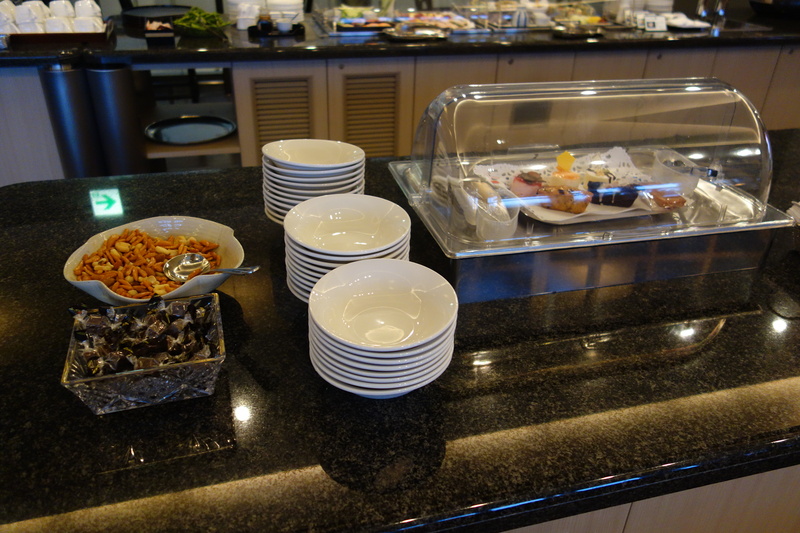 The buffet featured salads, udon noodles, desserts, breads, soups, two hot entrees, curry, and rice. The food was all generally good, although I felt that it wasn’t quite up to the standard of the food at the lounge in the main terminal. One thing that I’ll point out that the satellite lounge lacks is a sushi bar. They have a sushi bar with actual sushi chefs in the first class lounge in the main terminal. Like where they don’t serve the sushi with wasabi on the side because they already put wasabi on the sushi. And the rice is ridiculously delicious. A number of lounges around the world serve sushi (e.g. the United Club at HKG, the ANA Lounge at NRT, the Emirates First Class Lounge in Dubai), but this is by far the best sushi that I’ve had in a lounge, and it’s better than most of the sushi I’ve eaten at restaurants in the US. Granted, the sushi bar is not open the entire time the lounge is open–it’s only open for lunch and dinner (although I would happily eat sushi for breakfast). Sushi bar in the main lounge! Anyway, I know people disagree, but I really like JAL’s first class lounges. The lounge in the main terminal is strictly superior to the lounge in the satellite terminal because of the sushi bar, but it was nice that I was able to get a massage in the satellite terminal lounge (which I’ve never been able to do in the main terminal lounge). This entry was posted in JAL, Lounge Reviews, Travel, Trip Reports and tagged airport lounge, first class, jal, lounge review, nrt, travel, trip report on June 19, 2016 by Edward. I’ve previously reviewed the ANA Suite and Business Class Lounges at Satellite 5, but I checked ou the ANA Suite Lounge at Satellite 4 this time around. Unlike the last time I was at the ANA Suite Lounge, it wasn’t particularly crowded, and there were plenty of different seating options to choose from. If it is more crowded, though, I suggest checking out the private cubicles if you’re looking to get work done, as those seem to fill up last. The food options are pretty good. Not as good as my beloved JAL First Lounge, but definitely better than the United lounge. On this visit, I specifically liked the Pierre Herme croissants that they had. There are also hot food options (including the aforementioned miso soup), sushi, onigiri, and plenty of cold food options. The lounge also has a noodle bar. I’m always appreciative of made-to-order food in lounges, but I haven’t been impressed with anything I’ve had from the ANA noodle bars. I feel like all of the broths kinda taste the same, but the taste is rather mediocre. If it matters, I’ve heard that you can specifically ask for a vegetable broth instead of a dashi broth (which is made with fish), although I haven’t tried this myself. Overall, I think the ANA Suite Lounge is an okay first class lounge. There are a lot of food options, but nothing stands out in particular. The service is well intentioned, but I’ve had problems communicating in English (beyond the kabosu/miso soup thing). It can get crowded depending on the time of day. But I’d almost always choose this lounge over the United Global First Lounge, and those are the only two options for Star Alliance flyers at Narita. This entry was posted in ANA, Lounge Reviews, Travel, Trip Reports and tagged airport lounge, ana, ana suite lounge, lounge review, nrt, travel, trip report on February 4, 2015 by Edward. The United lounges at NRT and HKG are regularly cited as the best United lounges in their network, which is perhaps more a testament to the fact that US lounges are pretty crappy. But on my layover at NRT between my two Singapore Suites flights, I decided to stop by the United Global First lounge to check it out (I have previously reviewed the United business class lounge at NRT) before heading to the more renowned ANA Suite Lounge. To get to the Global First Lounge, you need to go up a floor from the normal United Club. There’s an elevator just inside the entrance to the club, and the lounge dragons will tell you if you’re eligible to go up. Essentially, you need to be flying first class on a Star Alliance airline to get in. The Global First Lounge is a nicer replica of the business class lounge underneath. It’s a large open space with tons of seating and some nice apron views. While the United Club can get very crowded given that it’s open to business class passengers, people with United Club memberships, Star Alliance Gold members, and people willing to shell out for a day pass (or who have free day passes courtesy of a credit card), the Global First Lounge is a relative wasteland since it’s the same size with a small fraction of the number of passengers. I think I saw three other passengers during my visit. I think people generally get excited about the United lounges in NRT and HKG because they offer more food options than the United Clubs found in the US. While there are more food options, none of them looked particularly appetizing to me. And the sushi is definitely some of the worst sushi I’ve ever eaten. I did end up taking a shower at the United lounge instead of the ANA lounge because I feel like the ANA showers can get a little too toasty. If you have access to the United Global First Lounge, then you have access to the ANA Suite Lounges, and in almost all cases, I’d choose the ANA lounge over the United lounge, but that’s mostly because the food at the ANA lounge is significantly better than the food here. This lounge was very peaceful and quiet (even the ANA Suite lounge can feel overcrowded), and I do enjoy the apron views. I was also pleasantly surprised by the service in this lounge, and they speak English in this lounge by default, if that matters. All in all, if you want to eat, go to the ANA lounge, but otherwise, I’d go to this lounge again if it were more convenient for my departure gate. This entry was posted in Lounge Reviews, Travel, Trip Reports, United and tagged airport lounge, lounge review, nrt, travel, trip report, united global first on February 3, 2015 by Edward.